Fat gives meat flavor, but also decreases the overall nutritional value. The easiest way to reduce the amount of fat in your meat is to trim any visible fat from the edges before you cook it. Certain cooking methods might also help reduce the overall fat content of your meat, but you will not be able to completely rid your piece of meat of every gram of fat it contains. 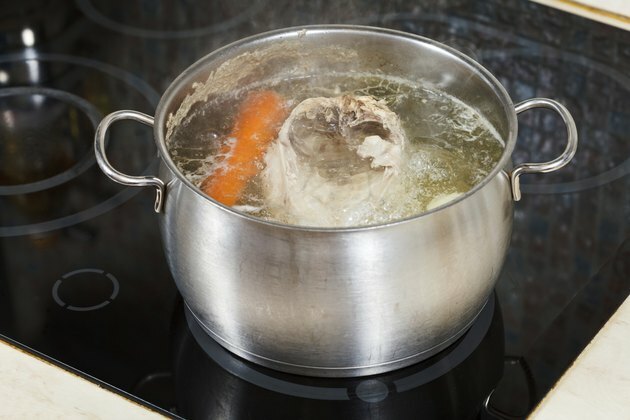 Boiling is one method that might reduce the fat content, but will not eliminate it. Fat is an essential part of your diet because it supplies you with energy and encourages your body to function properly. However, good fats and bad fats exist. Most meat contains saturated fats, which can be harmful to your health. Saturated fat elevates your total cholesterol level, which can increase your risk of developing heart disease. Saturated fat can contribute to the development of type 2 diabetes as well. When you reduce the amount of fat in your meat, you might reduce your risk of developing dangerous health conditions. When meat reaches a temperature of 464 degrees Fahrenheit, the fats are melted away from the flesh, according to MayoClinic.com. Boiling your meat can help reduce the fat content slightly, but will not rid your meat of all the fat it contains. Because boiling water only reaches a temperature of 212 F, the fat will not melt away from the flesh completely. You might melt the fat slightly, but the temperature is not hot enough to get rid of all of it. Boil your meat for a flavorful and tender dish, but not to significantly reduce the fat content. When you boil meat, it can become tender and juicy. This allows you to choose a lean cut of meat because you will not need to rely on the fat to moisten and flavor your meat. Trim your meat of any visible fat before boiling to further reduce the fat content. Bring your water or broth to a boil and add the trimmed meat. Turn the heat down and allow the meat to simmer, which is a slow boil, for three to four hours, or until the meat is tender. If you wish to reduce the fat content of your meat more significantly than you can with boiling, consider other cooking methods. When you broil your meat, you cook it at a temperature higher than 464 F so the fat is more likely to melt off. You can achieve similar results if you grill your meat at a high temperature. Choose a lean cut of meat to begin with and you won't need to worry as much about getting rid of the fat. Top round, bottom round, sirloin and tenderloin cuts are among the lowest in fat. Extra-lean ground beef or white meat poultry are additional options that are already low in fat. What Meat Can You Eat for a Gallbladder Diet? What is the Best Way to Sear & Bake a Ribeye Steak?